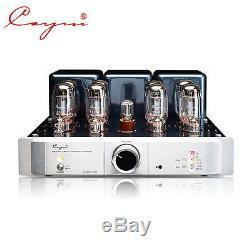 Cayin A-100TMK2 Vacuum Tube Integrated Amplifier AMP TR / UL Mode BIAS ADJ. This integrated valve amplifier looks as good as it sounds. The owner may adjust the bias of the power valves by using gain controls and a high precision VU meter on the outside of the amplifier. To control the input voltage of the power stage, it uses 6SN7 valves, which improve the stability of the four KT88 for each channel. This makes the frequency range of the power stage more linear. That may sound very complex to anyone not involved in the secrets of valve design, but you dont need to be a technical expert to feel the beauty of sound reproduction, which is possible by connecting it to your speakers. Specially new designed output transformers for this edition. Gold plated phosphorated copper pins porcelain tube sockets. High end purple copper speaker out terminals. Teflon Silver plated high purity internal wiring. High precision VU meter on the top plate. Bias adjustment easily done outside. 6SN7 x 1 + 12AU7 x 4 for preamplifier session. 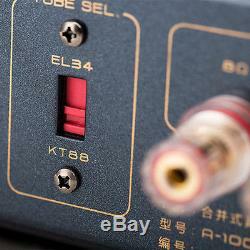 The power amplification uses KT88x8 for class AB1 Push-pull power amplifier. Japan Takman carbonic film high end for audio resistors. New protection circuitry for ac and audio transformers. Automobile grade paint finish on top chassis. Can be used as integrated amplifier or power amplifier. High end Nichicon capacitors and audio choke coil. High quality Japan ALPS motorized volume control. Ultralinear / Triode mode selection (selectable via remote control unit). All point to point wiring (hand soldering). 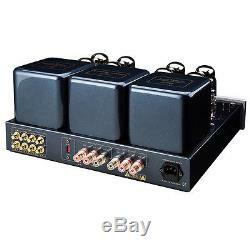 3 pairs RCA input + 1 pair RCA pre-amplifier input. 4 / 8 selectable output load impedance. Removable metallic tube protection cage included. Output Power: 45W+45W (RMS Triode mode). Input Sensitivity: 350mV (be Integrated AMP). Power Consumption: 480W (MAX), 280W (MIN). Tube: 12AU7 x 4, 6SN7 x 1, KT88 x 8. We don't overcharge the cost. Please don't bargain or argue with us for this point. What we used is hongkong post , which may take around 15-30 days to arrive from the date of dispatch issued This is for USA, CANADA, AUSTRALIA, EU, Asian Countries. For the other countries, it may take more time to arrive. Excluding contrived damagement or misusage. In case of DOA, Please notice us within 3 days and return the case within 7 days after receiving the items. (The date on Post Mark is for standard). In order to provide you the best service. Feedback is our life, before you leave a neutral or negative. During holiday , pls allow us to response you early next week , kindly not leaving negtive/neutral feedback or make dispute/claim out of our working hours, thank you for your cooperation. 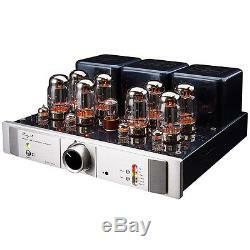 The item "Cayin A-100TMK2 Vacuum Tube Integrated Amplifier AMP TR / UL Mode BIAS ADJ" is in sale since Saturday, July 15, 2017. This item is in the category "Consumer Electronics\TV, Video & Home Audio\Home Audio\Receivers & Amplifiers\Amplifiers & Preamps". The seller is "annie-audio" and is located in . This item can be shipped worldwide.